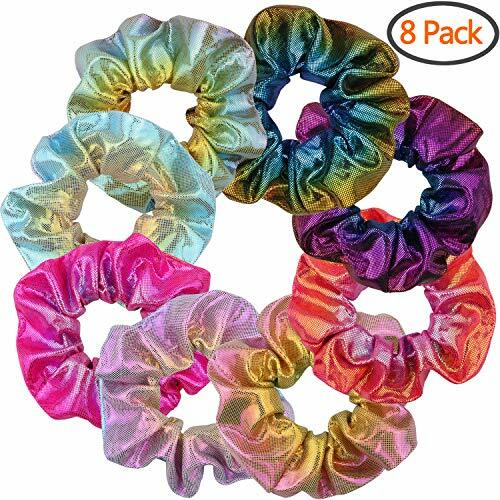 These BETITETO Gradient Hair Scrunchies are made of shiny holographic fabric and durable elastic band, vintage and comfortable, can fit for most of women or girls hair. one set with 4 styles two-side gradient mermaid colors scrunchies, make you charming on various occasion, perfect gift for youself or your friends and families. - Due to the monitor and light brightness, there may be color difference between the picture and item you will be received, please understand. - Please allow 0.3-0.7 in size error due to manual measurement. - Please allow a little fragmented fabrics due to clipping. - Our brand has changed to registered brand " BETITETO ", but some of the items with old package still with brand "Yogaily", please understand. ❤ REGULAR SIZE PONYTAIL HOLDER - The unexpanded inner diameter is approx. 4.5 cm/ 1.77 inches, the outer diameter is 11 cm/ 4.3 inches, MAX stretched diameter is 18cm / 7.1 inches, fit most ladies' hair. ❤ FASHIONABLE HAIR ELASTICS - Good assistant for your make up and easy to DIY your own hairstyle, make you stylish on various occasion, such as office, school, travel, 80s party, ceremonies,performance, cheerleader show, practical and beautiful for you. ❤ GRADIENT COLOR HAIR TIES - package includes 4 styles scrunchies, one scrunchy with two side gradient mermaid colors. One set with total 8 pieces of hair scrunchies, enough for your need. ❤ BEST GIFT CHOICE - 2018 trendy fabric with shiny design hair bobbles, suitable for all the ladies, good gift for youself or your friends and families. If you have any questions about this product by BETITETO, contact us by completing and submitting the form below. If you are looking for a specif part number, please include it with your message.